Question: Most Buddhists in the modern world don’t understand why there is no equality between nuns and monks in the Tibetan tradition. What could we do to promote the development of gender equality in Tibetan Buddhism? Answer: Actually Tibetan Buddhism is the pure tradition of Nālandā Buddhism, there is no doubt about that,¹ and Buddha himself did not discriminate between male and female. The highest level of ordination for a man is that of a bhikṣu. Similarly, the highest level of ordination for a woman is that of a bhikṣuṇī. Basically they have the same rights. Especially in Tantrayāna, the female is more important. To criticize a woman is a transgression of a Vajrayāna vow, but in the Vajrayāna there is no vow saying women are not allowed to criticize men. So we men have to complain (laughs). The problem concerning the highest ordination of the Buddhist nun, the bhikṣuṇī, is that there are different Vinaya traditions. In Thailand, Burma [and other South Asian and Southeast Asian countries], they follow the Theravāda Vinaya. 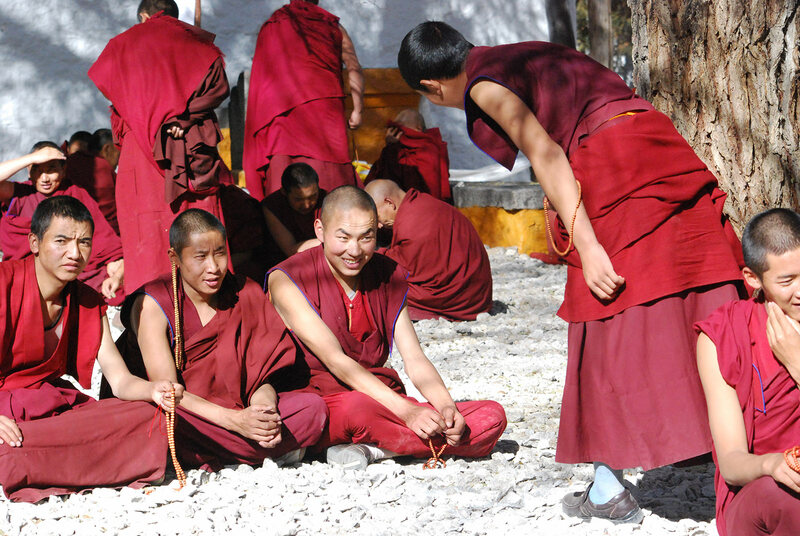 The Tibetan monastic system follows the Mūlasarvāstivāda Vinaya. There are four major traditions in the Vinaya tradition. In the Chinese Canon there are some more traditions.² Śantarakṣita introduced the monastic system into Tibet in the 8th century. I think he himself belonged to the Mūlasarvāstivādins. Then Atiśa Dipaṃkara came to Tibet in the 11th century. Some Tibetans asked him to give the bhikṣu ordination, but some of his senior students like Dromtönpa asked him “please do not give the Vinaya vow” because Atiśa Dipaṃkara’s tradition was not Mūlasarvāstivāda.³ They thought it would be better to have just one Vinaya tradition because there are slight differences between them. For example, in the Theravāda tradition, the Theravāda Prātimokṣa,⁴ the number of precepts of a fully ordained monk is 227. According to the Mūlasarvāstivāda tradition, in our Prātimokṣa, there are 253. So there are some differences. According to our tradition, the ordination of a bhikṣuṇī must be carried out by a bhikṣuṇī preceptor, and since a Mūlasarvāstivāda bhikṣuṇī preceptor is not available, according to our tradition the bestowal of ordination stopped. This is the problem. During the last thirty years we examined whether there are some exceptions to this. Some scholars say an exception is possible but the majority still says “no”. I have no power according to Vinaya (laughing). According to Vinaya, the final decision must be made by a saṅgha—a group of monks—not by a single monk. I think here we have to “complain” a little bit to the Buddha himself. While he was alive, he was the final authority; it was in his own hands. When he passed away, he didn’t give final authority to a single person, but to a group of monks. That is the problem now. Question: Do you think the next Dalai Lama should be a woman? Answer: Twenty or thirty years ago, a journalist from a French women’s magazine asked me this question for the first time. Can the Dalai Lama’s incarnation be female in the future? I say, yes, because firstly, there are already high female reincarnations among Tibetan lamas. For example Samding Dorje Phagmo is an incarnation tradition which has existed, I think for seven or eight hundred years.⁵ That reincarnation lineage is almost as old as that of the Karmapa,⁶ I think it must have begun around the time of Lama Tsongkhapa.⁷ In our time there are high female lamas as well. Yes, we accept female gurus, female teachers. The purpose of a reincarnation lineage is to serve people through the Dharma, and if the circumstances are such that a female form is more useful, then why not? I mentioned that to the French journalist. I also said half-jokingly that if the Dalai Lama’s reincarnation is female, she must be very attractive. The reason is so that she will have more influence on others. If she is an ugly female, she won’t be very effective, will she? What do you think? (laughs). Good! Thank you very much! ¹ Nālandā was the biggest Buddhist University in India. It was founded in the 5th century. Tibetans challenge the expression “Tibetan Buddhism”, which doesn’t exist in the Tibetan language. They understand their Buddhism as the continuity of Indian Buddhism, especially that of the Nālandā tradition. ² Vinayas were translated into Chinese: Sarvāstivāda, Mūlasarvāstivāda, Dharmaguptaka, Mahīśāsaka and Mahāsāṅghika. However, since the early eighth century only the Dharmaguptaka tradition has been practiced in China. ⁴ The Bhikṣu and Bhikṣuṇī Prātimokṣas list the bhikṣu and bhikṣuṇī precepts and are recited twice a month. ⁵ Samding Dorje Phagmo founded one of the few female Tulku lineages. In the early 15th century the princess Chökye Drönme was considered an emanation of the meditation deity Dorje Phagmo. She became a nun. For details see: Hildegard Diemberger, When a Woman Becomes a Religious Dynasty: The Samding Dorje Phagmo of Tibet. New York: Columbia University Press, 2007. ⁶ In 1288 the great yogi Orgyen Rinchen Pal recognized his master Karma Pakshi (1204-1283) in a child. This child, the third Karmapa Rangjung Dorje (1284-1339), was the first official tulku in Tibetan history. Images: Header and first background image © Manuel Bauer. Second background image © Elke Hessel. With kind permission from Michaela Doepke and Bhikṣuṇī Dr. Jampa Tsedroen (Carola Roloff). The questions were asked by Michaela Doepke, the footnotes were added by Jampa Tsedroen. Edited by Jampa Tsedroen (Carola Roloff), Thubten Chodron and Mark Wehrmann.